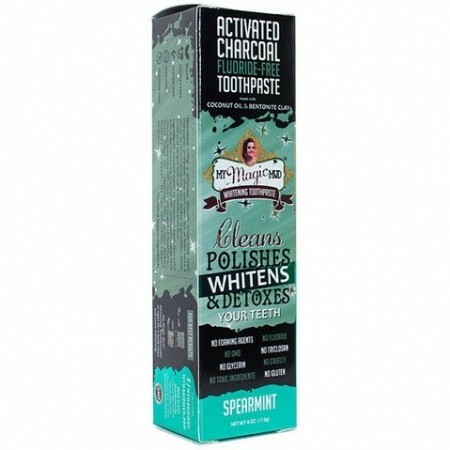 Spearmint flavour My Magic Mud Whitening Toothpaste. 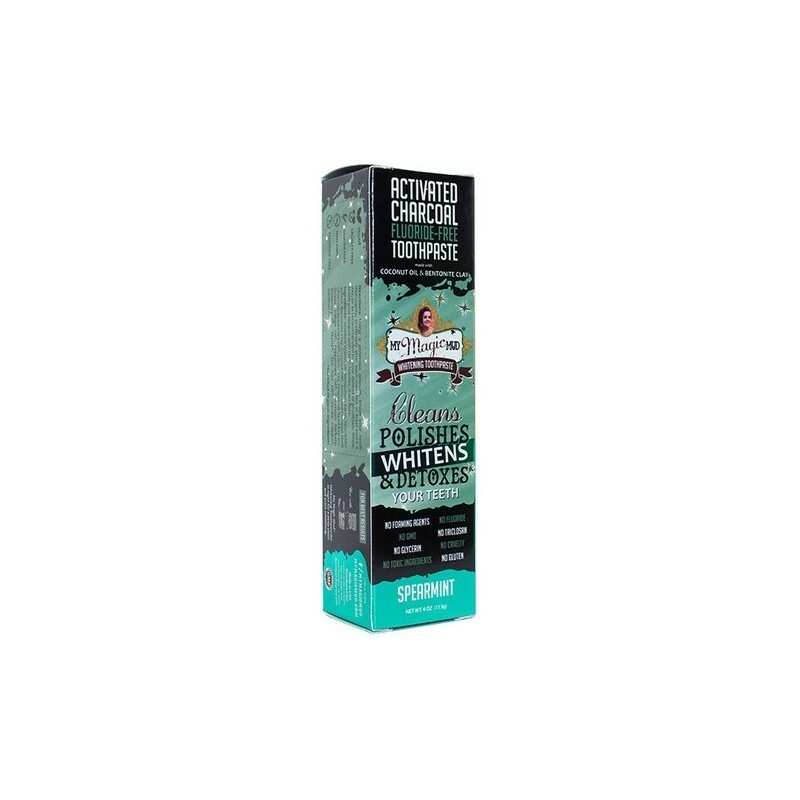 Made with 95% certified organic ingredients and fluoride-free, this toothpaste whitens and cleans teeth with activated charcoal, coconut oil and bentonite clay. Contains spearmint oil. 113g. Choose toothpaste that is free from synthetic chemicals, foaming agents like sodium lauryl sulphate, and that is made from simple, raw ingredients. No flouride, triclosan or foaming agents. Use after every meal or at least twice a day. Deeply cleans and removes toxins. Gentle on enamel and reduces sensitivity. Contains a touch of organic stevia and the right essential oil combination to deliver a great taste and texture. The activated coconut shell charcoal scrubs your teeth while actively detoxifying your mouth. Brush with a generous amount of toothpaste (as there are no foaming agents present the paste can dissolve) at least twice a day, or ideally after every meal. Use My Magic Mud Charoal Teeth Whitening Powder at night. 113g/ Distilled water, diatomaceous earth, Non-GMO xylitol, bentonite clay, coconut oil*, activated coconut shell charcoal, spearmint oil*, clove oil*, citric acid, grapefruit seed extract, sweet orange oil* peppermint oil*, potassium sorbate, rosemary oil, stevia*, tea tree oil*, vanilla extract*, xanthan gum.